Contact lenses or LASIK surgery can induce monovision to enable middle-aged people who are both myopic and presbyopic to avoid having to wear glasses. People wear corrective lenses for a variety of visual problems. The most common is being near-sighted (myopia) or with age, becoming less able to focus on objects that are close to the eye (presbyopia). One might hope that being both near-sighted and presbyopic would cancel each other out, but it does not work that way. Lenses that correct for myopia make presbyopia worse, and vice versa. For people who are both near-sighted and middle-aged, the only solution used to be two sets of glasses: One pair for distance vision and another for reading. Bifocals and trifocals provide one way to keep the number of pairs of glasses needed to a minimum. But what about people who do not want to be burdened with even one pair of glasses? There is a treatment strategy, called monovision, that allows a contact lens wearer to enter middle-age without needing a pair of reading glasses. The trick is simply to make the two contact lenses of different strengths, so that the contact lens in the dominant eye corrects for myopia (distance vision), while the contact lens in the non-dominant eye corrects for presbyopia (near vision). The idea is that normally, the person will see the image produced by his or her dominant eye, and when the person needs to view something up close, like printed matter, the non-dominant eye’s image, which will be in focus, will become more salient. According to a study by Garcia-Gonzalez et al., in the American Journal of Ophthalmology, the success rate for contact lens-induced monovision is 86% for people who are already successful contact lens users. It can be far less successful for people who are not already comfortable wearing contact lenses. But are there surgical options for someone who is both myopic and presbyopic? Not everyone, however, is a good candidate for LASIK surgery. According to an article by Dr. John Messmer in the January issue of American Family Physician, people who have ulcers in their corneas, an autoimmune disease, diabetes (especially with reduced corneal sensation), dry eyes (especially sicca syndromes), a history of herpes infection, eye problems due to Graves’ disease, or a thin cornea could have problems during or after the surgery. Children, adolescents, and pregnant or lactating women are not likely to have a good experience with the surgery since their eyesight could be changing. Also, people who have a high degree of astigmatism may not be prime candidates for a surgical approach. 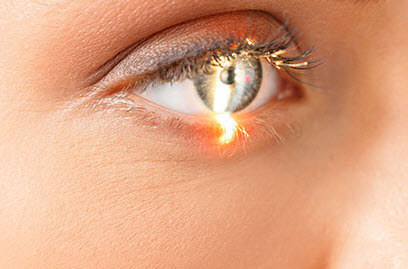 One cautionary note, according to Messmer, is that “Dryness sensation after LASIK is fairly common in normal eyes.” For some people, such dryness may be a worthwhile price to pay for not having to wear glasses or contacts, while others might find this to be a deterrent to having the surgery. But for those myopic people who need or want to remain glasses-free as they age, monovision, induced via contact lenses of different strengths or by LASIK surgery, provides a way to do so. Garcia-Gonzalez M, Teus MA, Hernandez-Verdejo JL. “Visual outcomes of LASIK-induced monovision in myopic patients with presbyopia.” American Journal of Ophthalmology. September 2010. 150:381-6. Howes FW. “Indications for lens surgery/Indications for application of different lens surgery techniques.” In: Yanoff M, Duker JS, eds. Ophthalmology, 3rd ed. Philadelphia, PA: Mosby; 2008. Messmer JJ. “LASIK: A primer for family physicians.” American Family Physician. 2010. 81(1):42-7. Error: Error validating access token: Session has expired on Friday, 12-Apr-19 14:10:09 PDT. The current time is Sunday, 21-Apr-19 11:36:49 PDT.